'Afreet' - (Marky Smith, R. 2015. Seedling 11-16A. AB (OGB-), 26" (66 cm), Early midseason bloom. Standards lavender-blue (RHS 92A), heavy bronze-green midrib, edges slightly brown; style arms smoked yellow-green (160A); Falls uneven blended colors, wide bronze-green edges, brown center with dark red veining bleeding from black spot at tip of beard, hafts yellow ground with brown veins; beards dark brown in throat and middle, tips pale yellow; some ruffling. 'Hannah’s Prayer' X 'Brash'. Aitken 2017. From Aitken's catalog, 2017: AFREET (AB) (M. Smith '17) OGB 11-16 A AB (OGB-) 26” (66 cm) EM. In Arabian mythology, Afreets are dangerous spirits. In your garden, this will be an unusual, but wonderfully welcome visitor. 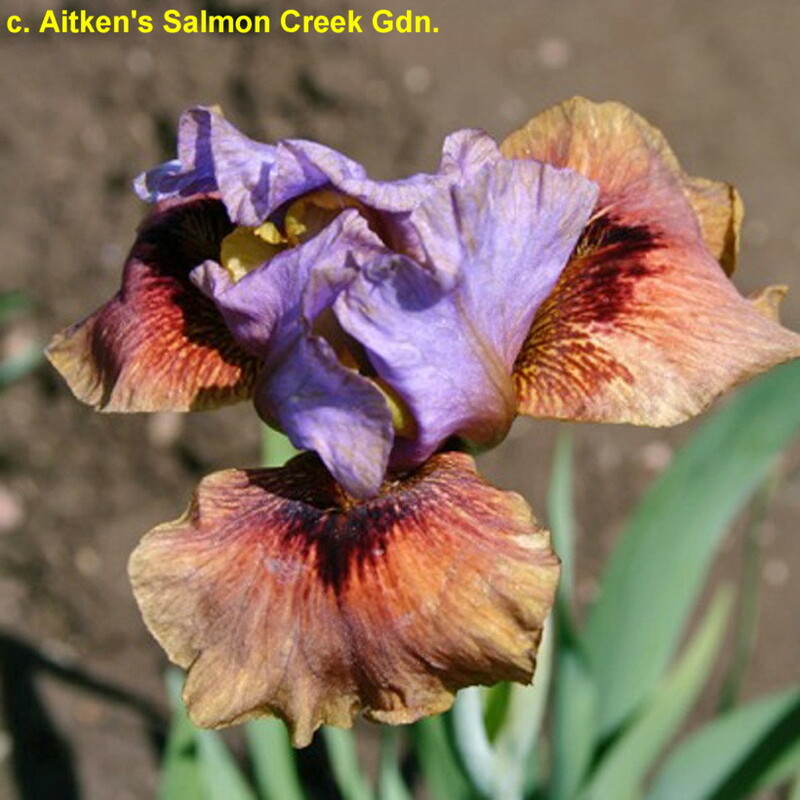 Closed, ruffled standards are lavender blue with slightly lighter edges and a heavy bronze-green midrib. Styles arms are smoked yellow-green. The wide, ruffled falls are unevenly blended, peach-tan at the distal end and edges, browner ground toward center with dark red veining bleeding from all around a black-brown aril signal below a dark brown beard with pale gold tips. 4 buds. Sdlg. #11-16 A: (Hannah’s Prayer X Brash). $25.00.